Yes, it would be difficult to exaggerate my enthusiasm for your book, for though I know little of astrology, I can recognize deep, true, original thought when I encounter it. Rudhyar’s works continue to grow into the undoubtedly permanent importance among us. Everywhere of the finest and most cohesive musicianship, their beautiful cantillations have already survived a half dozen changes of the popular mood, and his fine work continues. One longs to hear his orchestral works prepared, performed, and recorded in a manner equal to them. Why this is not yet done is a major mystery! Rudhyar experienced a strenuous divorce during April 1945, and soon afterward he married Eya Fechin, daughter of the famous Russian painter, Nicolia Fechin. Rudhyar and Eya left California to live in Colorado Springs and, in 1947, in Nambe, New Mexico. These were happy and productive years. A book Modern Man's Conflicts — The Creative Challenge of a Global Society was written in 1945-46 and published in 1948 by the Philosophical Library in New York. 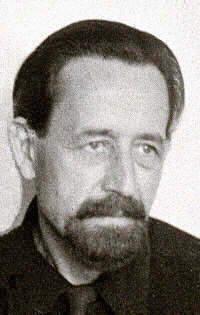 He wrote a number of series for the magazines Horoscope and American Astrology, which were later revised and in book form and published as The Lunation Cycle, The Practice of Astrology, Triptych, The Astrological Timing — The Transition To The New Age (originally Birth Patterns for a New Humanity). A work attempting to reformulate the basic images of Christian-Western culture was written in 1948, and later recast entirely in a new style and published as Fire Out of the Stone. These years were the most productive in the field of painting. Rudhyar loved New Mexico. At one time he had planned to build a house near Santa Fe on land bought for him by the composer Charles Ives, but his divorce interfered. There were several reasons for leaving New Mexico. One was a meeting with the pianist William Masselos who, on his own initiative, had discovered the score of Granites. Masselos performed this composition in Albuquerque, New Mexico and afterward he and Rudhyar became staunch friends. He told Rudhyar of the interest young musicians in New York were taking in his music, as well as in his astrological writings, and of their desire to meet him and have him with them in New York. Also Eya, who had been a modern dancer in the Lester Horton Dance Company, had begun a compelling form of work dealing with personality-readjustment through basic body-movements, described in her booklet Eutonles. She felt the need to study certain aspects of psychology with a sympathetic psychologist. The latter turned out to be the remarkable pioneer in group-therapy and the founder of Psychodrama, Dr. Jacob Moreno. 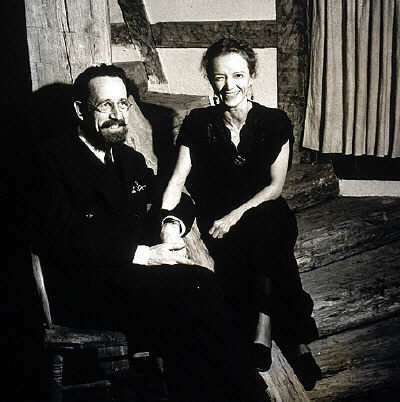 Rudhyar and his second wife, Eya Fechin, at home in New Mexico. A stay in New York during February-March, 1949 brought many interesting contacts in the musical field, but also the realization that the New Mexico episode had to be concluded. The early fall saw Rudhyar and Eya once more in New York. During the winter 1950 Rudhyar's orchestral work Ouranos and his piano compositions were given at a concert at the Composers Forum on March 15, 1950 and Maro Ajemian played his Prophet-Icrite in April. Eya met Dr. Moreno at that time and decided to study with him at his psychiatric hospital in Beacon, New York. Rudhyar passed that summer at the MacDowell colony in Peterborough, New Hampshire composing a Quintet for piano and strings. A recital of Rudhyar's music was given in Carnegie Recital Hall on November 13, 1950, with the assistance of William Masselos and Anahid Ajemian, violinist. Rudhyar performed several of his piano compositions. The New Music Quartet gave a remarkable performance of Rudhyar's brief work Solitude on March 17, 1951. Rudhyar passed the winter 1952 in New York City, and later in Washington DC. During the following summer, a house was rented in Spring Valley, New York within the Threefold Farm estate dedicated to the ideals of the great German philosopher, occultist, educator and creative artist Rudolph Steiner. Lack of money forced Rudhyar and Eya to give up living in New York. Eya accepted an offer to start a department of Psychodrama at the Mental Institute in Independence, Iowa. She showed exceptional and natural gifts as a psychodrama director and had been warmly recommended by Dr. Moreno. Rudhyar and Eya reached the institute just after Rudhyar's 57th birthday. During his stay in Iowa, Rudhyar had no outlet for his creative activity, except the writing of a few astrological articles, and this was even at a low because several magazines to which he had contributed had to close. He became acquainted with the Science Fiction field, and his interest was aroused. Through the year 1953 he wrote a novel Return From No-Return, two novelettes, and a number of short stories. In these works Rudhyar displayed his most fertile imagination, but he placed too much emphasis on occult themes and poetic verse, and not enough attention on scientific gadgetry, to find acceptance. Many years later, however, Return from No-Return was published in 1973 by the Seed Center, Palo Alto. The stay in Iowa, which lasted until December 1953, proved quite traumatic. Eya fell in love with her assistant, who was a patient at the institute, and during a return trip to California she asked for a divorce. Rudhyar passed the winter of 1954 in Cathedral City, near Palm Springs, California, where he had often gone for rest in the past. Money was very scarce, but deep inner experiences provided the strength to meet the crucial test which opened the way for the significant work which occupied Rudhyar's later years.